...and since it was St. Patrick's Day, I served it with a pot of liquid gold (syrup) and a glass of green milk to wash it all down. 1. 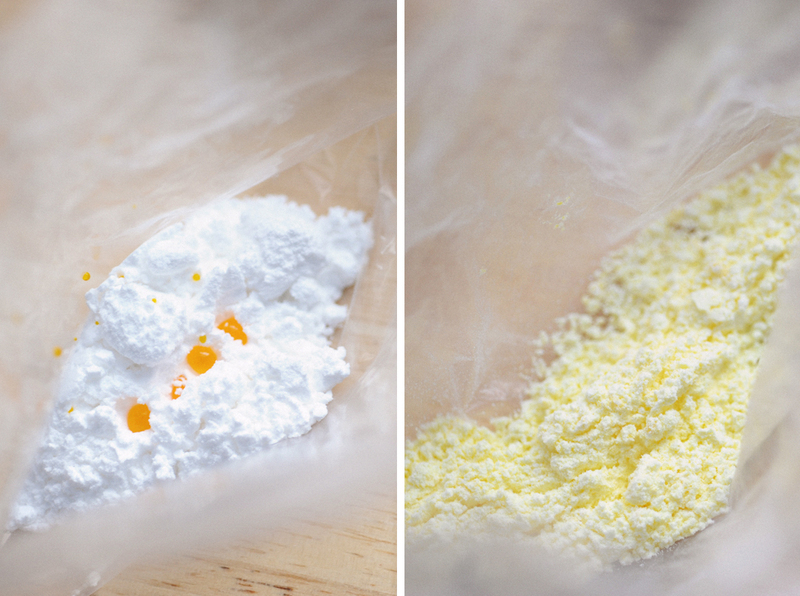 Combine a spoonful of powdered sugar and 6-8 drops of food coloring in a small sandwich bag. 2. Squish the bag between your fingers until the food coloring is mixed with the powdered sugar. If the food coloring sticks to the bag, rub the sugar against it to mix the color in. Add more food coloring, if necessary, to get the desired color. 3. Secondary colors (orange, green, and purple) are easy to make by combining already colored sugars (red + yellow = orange, red + blue = purple). 4. Store in an airtight container until you're ready to use them. What a fun surprise for St. Patrick's day. I love that the syrup is liquid gold. I've just pinned this for next year! Better than my old way of making and storing the colored sugar; thanks for the tip. Can you still sift it? Yes. It's hard to tell from the photo because I just sprinkled it on the toast with my fingers, but the sugar was dry and not clumpy at all.